I hope some of you have had the opportunity to use the Big Game Logic (BGL) website and figure out how it works because in upcoming articles I am going to discuss how you can use BGL to help you pattern wildlife and manage your property. For many, deer season is now over and it is time to start some predator management! Here is how BGL can help you figure out where to focus your efforts. Later, if you want to get a better idea of which areas of your property are overrun with coyotes, you can click on the notable “Coyotes” and hit the search button, and only coyote sightings will be displayed on your camp map. 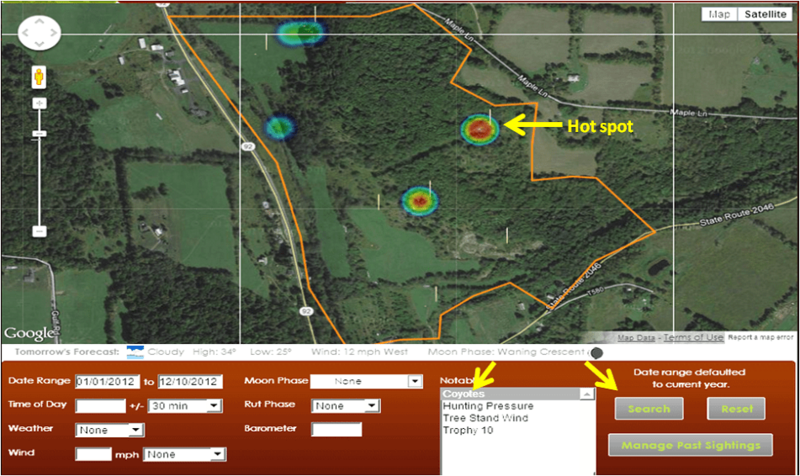 This is just one of many ways BGL can help you better manage your hunting property. I added trail camera and coyote sightings to the camp map and tagged them as the notable “Coyotes.” In the search tools below the map, I selected the notable “Coyotes” and clicked search to produce a map that shows me where “hottest” coyote activity is on this particular property.